There is something special about kid’s castle playhouses that appeals to young childrens imaginations and encourages them in their pretend play. Kids Castle toys, as regular readers of of our free newsletter (Toddler Report) know, are some of are favorite toddler toys. Play tents for kids offer the advantages of light weight, easy assembly and portability. 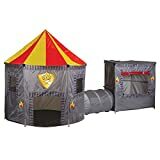 A Castle playhouse and a Kids indoor play tent! 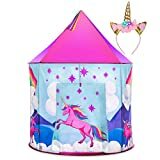 The Giant Castle combo comprises a colorful nylon castle playhouse and a tower which are connected by a tunnel. This Pacific Play Tent combination gives you 140 sq. feet of play area providing lots of hiding and crawl spaces and opportunities for imaginative play. It’s sure to provide hours of explorative and inventive fun for your kids! The castle play house structures are made from hard wearing, durable nylon fabric in a brick reproduction pattern.So they truly look like a pretend castle and tower. The two play tents have strong washable floors made of polyethylene. The tunnel for connecting between the two playhouse buildings is constructed using 4mm steel wire. 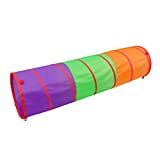 We especially liked the fact that the play tunnel wire is covered with ample sponge padding. 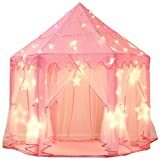 Ensuring kids playing in this castle tent are both safe and comfortable. Each component of the Pacific Play Tents Giant Castle combo sets up in just a few minutes and the playhouse can be easily stored away. This is a very durable kid’s playhouse and will last a long time . 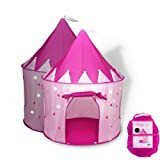 This castle playhouse/play tent has been featured in Parenting Magazine and was rated “Best Overall” by the Wall Street Journal – so you know it must be very good value! Kids play tents come in a wide variety of themes, sizes and colors. They are generally more affordable than either plastic or wooden childrens play houses. Play tents for children are light, easy to assemble and store away, and great fun for kids! This makes them an ideal choice for a kids indoor playhouse. Pacific Play Tents make a very attractive range of kids play tents to suit most budgets and available space. We are currently reviewing several of their tent playhouses so check back soon to see which we have included in our choice of best kids play tents. Better still, why not sign up for Toddler Report – our free newsletter, providing parents and carers with details of our choice of the best toddler toys, free play ideas and lots, lots more. Prices are accurate as of April 24, 2019 10:55 pm. Product prices and available are subject to change. Any price and availablility information displayed on Amazon.com at the time of purchase will apply to the purchase of any products.